Our journey began in the summer of 2013 in the heart of Asheville, NC’s South Slope Brewery District. 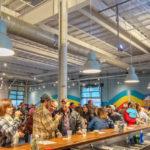 With the 2015 opening of their Big Top Production Brewery up the road, the next next goal was to bring a bring a physical location to Durham, NC. The new taproom consists of 8,844 square feet of interior space, as well as a 1,678 square foot outdoor covered patio and beer garden. The space is game and activity heavy, featuring full-sized shuffleboard courts, soccer pool tables, table tennis, and more. The bar’s 24 taps feature ours full line-up of beers, including year-round, seasonal, specialty, sour, and one-offs, as well as wine, local cider, and guest taps from neighboring breweries.